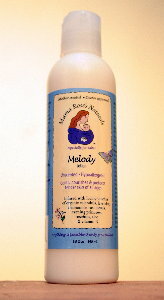 Mama Rose's Naturals Melody Lotion is a light, non-greasy medley of supreme natural ingredients, perfect for newborns and others with extremely sensitive skin and noses. It absorbs smoothly into skin, gently moisturizing while providing nourishment and protection. It helps normal, dry, or irritated skin to feel equisitely soft. For adults, Melody lotion is wonderful for those who would like to use a soothing natural lotion that will not conflict with the smell of their perfume, or for men that can benefit from a moisturizer without smelling like flowers. Suggested use: Massage lovingly into skin after bath time, before bedtime, or anytime. Can also be used to gently cleanse by applying to skin and wiping off with a Super Softee Baby Wipe or other soft cloth. Ingredients: Contains loving touches of calendula, lavender, chamomile, grapeseed oil, jojoba, shea butter, evening primrose oil, rosehip seed oil & vitamin E.